Parmalat Canada is thrilled to announce that its Astro Original Greek yogourt brand has won the 2012 Best New Product Award in the Yogourt category. The 2012 Best New Product Award winners were determined from the BrandSpark International Canadian Shopper Study, which surveyed more than 53,000 independent consumers who voted in 53 categories. Astro has been providing great tasting dairy products to Canadians for over 30 years. From the beginning, they have helped consumers maintain balance in their lives with products true to yogourt roots. They have kept up with the industry and consumer needs by creating new and exciting product lines. Astro Original Greek yogourt is available in Canada wherever Astro products are sold, in both a regular and fat free version. The regular 500 g format is available in three different flavours (Plain, Honey and Strawberry) and the fat free 500 g format is available in Strawberry and Peach flavours. More information can be found at www.astro.ca. Astro Original Greek provides two times more protein than Parmalat Canada's regular Astro Original yogourt products; it is an excellent source of calcium, contains eight essential nutrients and is made from natural ingredients. Interest in Greek yogourt is a rapidly growing trend in Canada as consumers look for a yogourt product that has superior taste, significant health benefits and is also versatile in use. Whether eaten on its own, used as a base for a favourite dip or spread or as an ingredient for cooking and baking recipes, Astro Original Greek yogourt is the clear choice for consumers. Parmalat Canada sent me a gift basket filled with goodies this week! 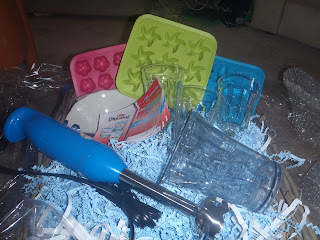 Included in the beautiful wicker basket was yogourt parfait glasses, yogourt bowls, yogourt spoons, a Cuisinart smart stick hand blender, ice cube trays and coupons to redeem for Astro Original Greek yogourt. I bought 1 of each regular flavour (honey, plain and strawberry) to try out. I am very happy to say that we liked the Astro Original Greek yogourt. My oldest had some of the strawberry with breakfast and he really enjoyed the taste. I made some yogourt pops (using the shaped ice cube trays) with the strawberry as well and they were a hit with the kids in the nice weather yesterday! The yogourt is smooth and creamy and, most importantly, tastes great! I am looking forward to trying out some recipes using the yogourt - so stay tuned to the blog to see how they turn out. Right now there are several promotions going on at astro.ca. the astro la la jingle is now available as a ring tone. Astro has a pomegranate flavoured yogurt. Oh snap! The astro jingle is available as a ringtone. Astro has a new berry multipack with 4 superberry flavours. Plant sterols help lower cholestrol! I learned that greek yogourt does not contain gelatin. yay! I learned that they have a recipe section. I'd love to try the Fruit Salad Smoothie! I learned they have a recipe section and would love to try Honey Strawberry Yogourt Muffins! I learned that they have beauty tip articles on the site. I learned that they have a honey flavored greek yogourt.....can't wait to try it! I learned that our bodies oxidation reactions can produce free radicals, which start chain reactions that damage cells. I learned that you can get a free ringtone for your phone. I learned that greek yogurt has more protein in it. I learned that Astro Smooth and Fruity yogourt is a good source of calcium and is available in 7 fruity flavours. I learned that Omega-3 is an essential fatty acid found in polyunsaturated fat, the good family of fats. A healthy diet low in saturated and trans fats may reduce the risk of heart disease. I noticed that they have a recipe section, would love to try Honey Strawberry Yogourt Muffins! Greek yogourt is quickly becoming popular in NA, and you can get regular or fat free, plain varieties as well as flavoured ones. I learned that antioxidants help to protect our cells from free radicals. I learned greek yog has more protein than other yog! I didn't realise they did flavours (aside from plain). Yipee! I learned that they have a healthy living section on their website. I didn't know that you had recipes on your site.